Berwick Hoppa is a hail and ride service. This means that as well as being able to board the bus at any of the bus stops situated along the route, passengers can hail the bus on roads where there are no bus stops. The driver will stop to pick passengers up providing it is safe to do so. The service runs at a set price of £1.50 for adults, 75p for children under 16 and is free to English concession card holders. 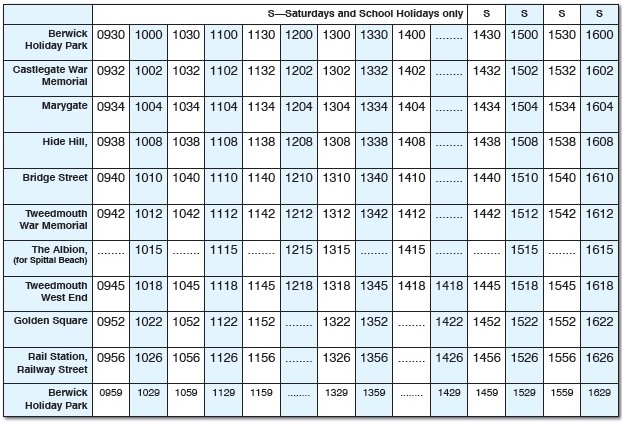 To download a text version of the Berwick Hoppa timetable please click here. In difficult weather conditions we reserve the right not to operate on certain roads without notice.